EBV is the etiologic agent of infectious mononucleosis and certain lymphoproliferative syndromes (Box 10). EBV can be cultured from the saliva of 10-20% of healthy adults. Excretion may persist weeks to months. Infection with EBV is by contact with infected secretions such as saliva. It is of low contagiousness, and most cases of infectious mononucleosis are contracted after repeated contact between susceptible persons and those asymptomatically shedding the virus. Secondary attack rates of infectious mononucleosis are low (< 10%), because most family or household contacts already have antibody to the agent. Antibodies to EBV are found in up to 90% of adults, although the percentage of susceptible adults is increasing in developed countries. The complete 172-kilobase-pair nucleotide sequence of EBV has been mapped. At present there appear to be many fewer genomic strain variations among EBV isolates than among other herpesviruses. Although morphologically similar to the other herpesviruses, EBV can be cultured easily only in lymphoblastoid cell lines derived from B-lymphocytes of humans and higher primates. The virus generally does not produce cytopathic effects or the characteristic intranuclear inclusions of other herpesvirus infections. After infection with EBV, lymphoblastoid cells containing the viral genome can be cultivated continuously in vitro; they are thus transformed or immortalized. Recent studies suggest that most of the viral DNA in transformed cells remains in circular, nonintegrated form as an episome, and a lesser amount is integrated into the host cell genome. Viral antigen expression has been studied by immunofluorescent staining of transformed cell lines under various conditions. One group of proteins called EBV nuclear antigens (EBNAs) appears in the nucleus before virus-directed protein synthesis. Viral capsid antigen (VCA) can be detected in cell lines that produce mature virions. Other cell lines, called nonproducers, contain no mature virions, but express certain virus-associated antigens called early antigens (EA). The latter may be seen as diffuse (D), and as restricted (R) aggregates of staining. Antibodies against these antigens can be detected by serological tests. Although EBV initially infects epithelial cells, the hallmark of EBV disease is infection of B-lymphocytes. The virus enters B-lymphocytes by means of envelope glycoprotein binding to surface complement (C3d) receptor; 18 to 24 h later, EBV nuclear antigens are detectable within the nucleus of infected cells. Expression of the viral genome is associated with immortalization and proliferation of the cell. The EBV-infected B-lymphocytes are polyclonally activated to produce immunoglobulin and express a lymphocyte-determined membrane antigen that is the target of host cellular immune responses. During the acute phase of infectious mononucleosis, ~ 20% of circulating B-lymphocytes demonstrate EBV antigens. After infection subsides, EBV can be isolated from only ~ 1% of such cells. 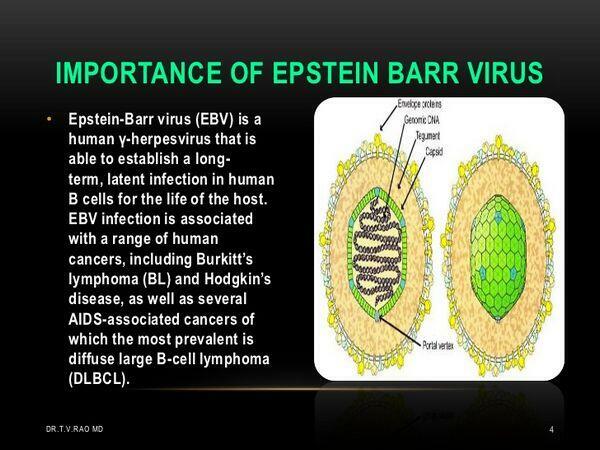 EBV has been associated with several lymphoproliferative diseases including African Burkitt’s lymphoma, nasopharyngeal carcinoma, and lymphomas in immunocompromised patients. The factors that render the EBV infections oncogenic in these cases are obscure. The distribution of EBV infections in Africa has suggested an infectious cofactor, such as malaria, which may cause immunosuppression and predispose to EBV-related malignancy. In the case of nasopharyngeal carcinoma, environmental carcinogens probably create the precancerous lesion, which then stimulates the EBV to reactivate. EBV-associated lymphomas have been shown to be of both monoclonal and polyclonal origin. Chromosomal translocations in B cells are characteristic of Burkitt’s lymphoma and involve specific breaks in chromosomes at sites of genes encoding immunoglobulins. These translocations lead to expression of oncogenes that may contribute to clonal activation and ultimately to malignancy. Some breakdown in immune surveillance also appears to play a role in the development of malignancy because immunosuppressed patients are more prone to develop B-cell lymphomas. Transplant recipients may develop a lympho-proliferative syndrome with very high titers of EBV in blood. EBV-infectious mononucleosis results in the synthesis of circulating antibodies against viral antigens, as well as against unrelated antigens found in sheep, horse, and some beef red blood cells. These heterophile antibodies, a heterogeneous group of predominantly IgM antibodies, are commonly used as diagnostic tests for the disease. Some other immunologic functions are also affected by EBV infection. Cutaneous anergy and decreased cellular immune responses to mitogens and antigens are seen early in the course of mononucleosis. Although EBV infects B-lymphocytes, the lymphocytosis associated with infectious mononucleosis is caused by an increase in the number of circulating T cells, which appear to be activated cells developed in response to the virus-infected B-lymphocytes. With recovery from illness, the atypical lymphocytosis gradually resolves, and cell-mediated immune functions return to preinfection levels. As with most of the herpesviruses (except varicella), most primary EBV infections are asymptomatic. The clinical syndrome of infectious mononucleosis is characterized by fever, malaise, pharyngitis, tender lymphadenitis, and splenomegaly. These symptoms persist for days to one or more weeks but slowly resolve. Complication such as laryngeal obstruction, ruptured spleen, or a variety of CNS manifestations(aseptic meningitis, encephalitis, etc.) may occur in 1-5% of patients. Patients with primary or secondary immunodeficiency are susceptible to EBV-induced lymphoproliferative disease. The risk is greatest in those experiencing primary EBV infection rather than reactivation. The most characteristic clinical findings are persistent fever, lymphadenopathy, and hepatosplenomegaly. In AIDS patients, several distinct additional EBV-associated syndromes occur, including hairy leukoplakia of the tongue interstitial lymphocytic pneumonia, especially in infants and lymphoma of the CNS and elsewhere. Laboratory confirmation of EBV infectious mononucleosis is usually documented by the demonstration of atypical lymphocytes, heterophile antibodies, or positive EBV-specific serologic findings. Hematologic examination reveals a markedly raised lymphocyte and monocyte count with > 10% atypical lymphocytes. Atypical lymphocytes, although not specific for EBV, are present with the onset of symptoms and disappear with resolution of disease. Alterations in liver function tests may also occur. Although not specific for EBV, tests for heterophile antibodies are used most commonly for diagnosis of infectious mononucleosis. In commercial kits, animal erythrocytes are used in simple slide agglutination methods, which incorporate absorption to remove cross-reacting antibodies that may develop in other situations, such as serum sickness. The infectious mononucleosis heterophile antibody is absorbed by sheep erythrocytes but not by guinea pig kidney cells. Heterophile antibodies can usually be demonstrated by the end of the first week of illness but may occasionally be delayed until the third or fourth week. They may persist many months. 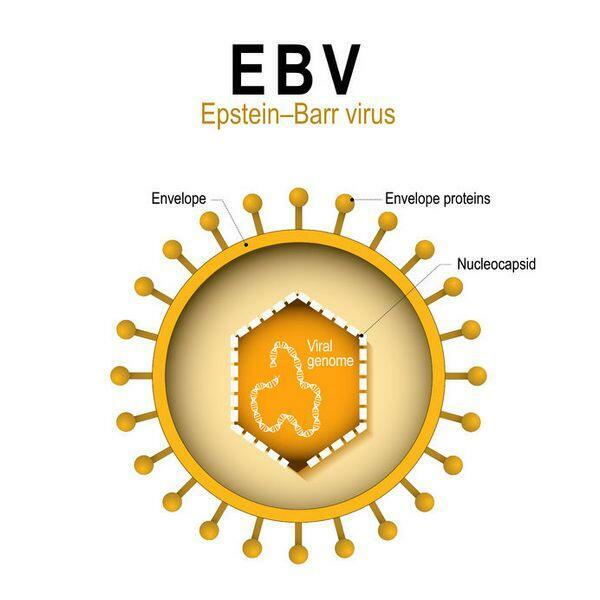 Approximately 5-15% of EBV-induced cases of infectious mononucleosis in adults and a much greater proportion in young children and infants fail to induce detectable levels of heterophile antibodies. In these cases EBV-specific serologic tests may be used to establish the diagnosis. Antibodies to VCA rise quickly and persist for life. The presence of IgM antibody to VCA is theoretically diagnostic of acute, primary EBV infection, but low levels may occur during reactivation of EBV, and cross-reactivation with antigens of other herpesviruses occur. Antibodies to EBNAs rise later in disease (after ~ 1 month) and also persist in low titers for life. Thus, a high titer to VCA and no titer to EBNAs suggest recent EBV infection, whereas antibody titers to both antigens are indicative of past infection. Persistent antibody to early antigens (anti-EA, -D, or -R) may be correlated with severe disease, nasopharyngeal carcinoma (anti-D), or African Burkitt’s lymphoma (anti-R) but are not useful in diagnosing infectious mononucleosis. Isolation of EBV from clinical specimens is not practical because it requires fresh human B cells or fetal lymphocytes obtained from cord blood. PCR is being developed to assay EBV DNA in blood. Treatment of infectious mononucleosis is largely supportive. More than 95% of patients recover uneventfully. In a small percentage of patients, splenic rupture may occur; thus, restriction of contact sports or heavy lifting during the acute illness is recommended. The DNA polymerase enzyme of EBV has been shown to be sensitive to acyclovir (INN: Aciclovir), and acyclovir can decrease the amount of replication of EBV in tissue culture and in vivo (Box 11). Despite this antiviral activity, systemic acyclovir makes little impact on the clinical illness. Corticosteroids appear to be beneficial in reducing laryngeal edema and severe toxicity. They may also be indicated for CNS complications. Treatment of EBV lymphoproliferative disease includes diminution of immunosuppression as much as possible; acyclovir is also used. Because EBV may be spread by direct person-to-person contact from even asymptomatic individuals, it is unavoidable. Isolation is not practiced owing to ubiquitous infection. The occurrence of Burkitt’s lymphoma and nasopharyngeal carcinomas in restricted geographic areas offers the possibility of prevention by immunization with virus-specific antigen(s). This approach is under exploration at present. A subunit vaccine has proved effective in preventing the development of tumors in tamarind monkeys, which are highly susceptible to the oncogenic effects of the virus under experimental conditions.